Hi everyone! It has been a project in the making and we’re beyond excited to announce… that we’ve revamped Parcel Post! 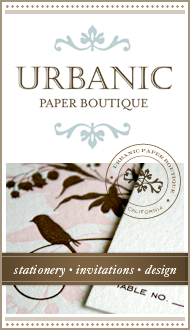 We’ve got a fresh new look and a new URL — urbanicpaper.com/blog. If you are subscribed to Parcel Post via RSS or have us in your feeds, please re-bookmark us. (Our wordpress.com site will no longer be active.) As a thank-you, we’ll be sending all of you a fun little surprise in the mail when you move over with us. See details on the new blog. Now, come see our new digs! I was going to post this one tomorrow, but just couldn’t wait, so here’s batch # 2 of some of the invitations we’ve received from the National Stationery Show this year. Every year, about the second week in May we get an influx of the best mail ever delivered to Urbanic. 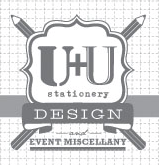 It’s an explosion of creativity from some of the best stationery designers across the country inviting us to visit them at the National Stationery Show. The trade show takes place once a year in NYC and is a showcase of the latest in all things paper and stationery related. I’ve made it a little tradition to post pictures of the mail we get every year. I’ll be posting pics the rest of this week, up until our departure for the show. For today, here are some blue-toned beauties. In honor of Mother’s Day, I’m dedicating this post to my mom, Olga Tantaros. She is beautiful, gracious, and so lovely inside – that if you were to meet her she would most likely shake your hand with both of hers. Her sheets are always folded to perfection and she believes dinner should be had every night with a proper table setting. Although she doesn’t love to cook, she has done it for us for as long as I can remember. My two sisters and I are the light of her life. She’s been invested in us since the time we were born and been by our sides through every endeavor, victory and hardship. She’s believed and supported Urbanic from when it was just a little card line made in my living room, and is still front row when it comes to all that is happening with our shop. In fact, I’m guessing she’s reading this post right now, since she subscribed to the blog. Any type-os’ mom? Thanks for being such a good role model of motherhood for me. love you. Florentine Frames by Cavallini & Co.
Let the outside reflect the inside! A gift’s presentation must be as perfect as the gift itself. A new gardening hat? Think flowers and wellies! We’ve matched up wrap and cards from around the shop to give you some inspiration as you prep for Sunday’s celebration. Make your Momma proud with how thoughtful she raised you to be. Find the perfect gift at Urbanic for the Mothers in your life! All products are available in our store, and many are featured in the Pop-Up Shop. In nearly two weeks, Moms everywhere will be celebrated. Let it begin with a thoughtful card from you to her! We are continually adding fun favorites to the Pop-Up Shop; Many many more are stocked at the Store. Due to our love of numbers, thought we’d put together a Perfect Gift for those who love them, too. This witty card pairs perfectly with this screen printed find for the kitchen. Give yourself a pat on the back for getting those taxes done! It’s springtime and I love the transition of color around the shop — things are feeling fresh and light again! I couldn’t help but notice this perfectly paired wrap and ribbon. As if the pink ombré isn’t amazing enough, the paper is reversible with mint green on the flip side! Sooooo good with Italian cotton ribbon. A match made for pretty pastel gifting! It’s been one year since our family trip to Paris . . . . .
I’m so happy to be finally blogging about it (and re-living it). We stayed in a darling apartment in the 7th right by the Eiffel tower and could actually see it from our window! We stayed for 2 weeks and spent most of our days adventuring around town – seeing sites, hopping on carousels and digesting the beauty and rich culture of the city. The metro got us everywhere. Definitely not easy with the two boys, but the kid-stand on our stroller was a lifesaver, enabling us to get down all of the narrow streets without taking up too much room. We ate as many baguettes, croissants and baked treats as humanly possible. We discovered marionette theaters, lovely parks, book shops, patisseries and boutiques – lots of boutiques! Being that we are shop owners, this was beyond inspiring. Our days were packed with exploration. At night during our walk home from the metro, we’d look up to see the Eiffel Tower sparkling above us on the top of the hour. It topped off each day with the very magic that started it. I literally have goosebumps right now remembering how special this was for all of us. Joshua made a little video of our treks in the city for our family. P.S. If you are thinking of planning your own trip to Paris, I would highly recommend heading over to the Oh Happy Day blog to get some great tips. Urbanic is hosting a Calligraphy Workshop on April 21st with the talented Molly Suber Thorpe of Plurabelle. Space is limited so if you’re aching to learn this beautiful art form, get your ticket now.